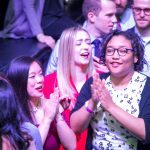 It took just a few seconds March 15 for UIC medical students to discover their reward for years of hard work. 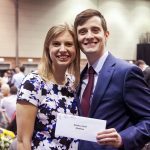 At 11 a.m. on Match Day, members of UIC’s College of Medicine Class of 2019 opened their white envelopes, which held their residency placements. 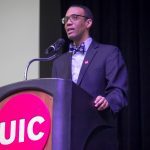 During the event at the UIC Isadore and Sadie Dorin Forum, the fourth-year students celebrated together after learning where they will train for the next three to seven years. 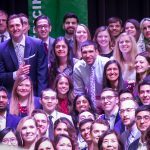 More than 32,000 students at medical schools nationwide were matched to residencies this year through the National Resident Matching Program. At UIC, 178 fourth-year medical students matched with residency programs, and the top specialties were internal medicine, emergency medicine and pediatrics. About 42 percent of UIC students will stay in Illinois, and the top placements were UIC (13 percent), University of Chicago and Loyola. Mark Rosenblatt addressed the medical students a day after the University of Illinois Board of Trustees approved his appointment as the new dean of the College of Medicine. Fifty-five students from the College of Medicine’s Rockford campus, 50 from Peoria and 24 at the Urbana-Champaign campus received their placements on Match Day. 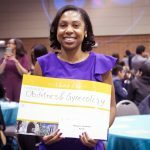 Antoinette Price cried tears of happiness when she read her match: training in family medicine at UIC — her first choice. She will be the first doctor in her family. “Match Day means not only the world to me, but also to my family,” she said. Price said she was impressed by UIC’s residency program. “At UIC, they put the residents first, which is awesome, and the teachers are phenomenal,” she said. Married couple Melissa Bogin and Ryan Kendziora matched together at the Mayo Clinic in Rochester, Minnesota. Bogin will train in internal medicine and Kendziora will complete his residency in pathology. Matching as a couple can be difficult, they said, but they were thrilled to learn they had both matched with their top choice. “I joke that it was like impromptu marriage counseling,” Kendziora said. They’re already house-hunting and excited to begin their programs in July. 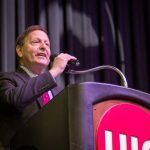 “It will be an adjustment to have so many responsibilities, but I think UIC really prepared us well,” Bogin said. “I’m scared but also really excited,” Kendziora added. Admasu Wondmagegn expects more hard work ahead as he begins his residency program this summer in internal medicine at Johns Hopkins in Baltimore, Maryland. “I think UIC has prepared me well — the rotations were really strong,” he said.